You are at:Home»Featured»What Do You Think: Is Facebook a Place for Priests? It’s true. I do not use Facebook. Now before you jump to any conclusions, I am not Amish and no, I did not grow up in a cave. I do not use Facebook because, quite frankly, I ‘m not sure I should be using it. Like so many things of this world, Facebook is just a tool that can be used for good or bad. It sure is handy if you want to get in touch with people, share thoughts, show pictures or recommend recipes. On the other hand, Facebook can be used for bad, see for example the article by Arwen Mosher entitled Facebook: A Marriage Killer? I guess it’s all about how you use it. But I’ve always had a little question: should a priest be using Facebook? What do you think? Being a seminarian, I have an interest in the various opinions on the issue. Some seminaries allow it, but others ban it. A diocese in Mexico has said that for a seminarian to open an account on Facebook, he must ask the bishop in person and have a written permission. Some priests have told me it’s an excellent tool, but other priests have said that they have had to stop using it. Young people have told me that they think it’s great to see priests on Facebook while others have felt a little uncomfortable when a priest they know had invited them to be their friend. What the Church says: It is clear that Pope Benedict is pushing the Church forward in this digital age and inviting us to use all the means at our disposal for preaching the gospel. Internet and social networks like Twitter, Myspace, and Facebook can be great tools to spread the Faith. Let’s face it, God can’t be left at Church in Sunday while we head back to work or school on Monday. He needs to be with us at all times. But, there still hangs a doubt about priests spreading the gospel on the internet. Would it be better for a lay person to do this? That’s where the people are: A fellow seminarian told me that we need to reach out and go where the people are. Sure there are millions of people on Facebook, but people can also be found in bars, dancing at night clubs and swimming on beaches. Just because the people are there doesn’t mean that a priest has to go and find them. Who are my friends? : Perhaps the biggest problem I found with priests using Facebook is their having to choose friends. As a priest I am called to love all of God’s people equally. Any priest will tell you that there have been moments in their life when they have had to sacrifice time with family or friends to rush off to the hospital or to fill in for another priest. A priest is called to love everyone as Christ would love them. Now, when a priest starts choosing some friends on Facebook, he is excluding others. How would his parishioners feel if some were on Father’s list but others were not? Do you invite everyone you know? Also, how do you say no to people who want to add you to their list when you do not want them to? One priest told me that he loved Facebook at the beginning because he got back in touch with many people he had lost contact with for years. But little by little he realized that his old friends didn’t share the same values that he did and he had to take them off his list since they kept sending him things he did not want to read or see. Choosing friends can be a pretty sticky job. It can be addictive: I have heard many people tell me that Facebook is addictive. They can’t stop checking it and it has even gotten in the way of their job and even their families. Would a priest who has given his whole life to follow Christ have the time to constantly check his account? “Time is money” they say, but for a priest truly in love with Christ, “time is souls”. Facebook or face to face: Priests are in the “people business” and it’s important to remember that people do not relate to priests as they do to others. I think it would be better for a priest to speak to someone in person so as to see their reactions or gestures and not misinterpret anything. Also, I can’t imagine a psychologist who invites his patients to be his friend on Facebook. It’s another level of relationship and should be put in the proper place. A priest is not just another one of the guys. Usually, when people open their hearts to a priest, they prefer to do it face to face and not via email. I know priests who use Facebook well and I know others who have decided to give it up. I guess I am hesitant because I know it can be a great tool for evangelization but I wonder if it is a tool priests should be using. What’s your take? Facebook, like many things in life, falls under the “when used in moderation” category. And I’ll add, when used wisely. People have different reasons, goals and motivations for using Facebook–catching up with old friends, connecting with others with like interests (from pro-life to knitting) having a single online portal to share pictures and news with family and friends, create business opportunities, promote political beliefs and yes, religious, moral and ethical views and opinions. In this light, it’s a perfectly FINE place for Priests to be. Through Facebook, I have access to the thoughts, homilies, and instructions of wonderfully grounded, conservative, “by the book” Priests. Guess what? I don’t have all that in my own parish. It is a widely acknowledged that one of the main problems with being a priest is loneliness. The antidote to this is healthy, intimate, and genuine friendship. It seems that any priest who holds himself aloft from deep friendship is setting himself up for emotional problems. A psychologist — since that was mentioned — has friends other than his patients. So it isn’t analogous to what this writer is saying about a priest. I’d love to know what some priests have to say about this. I would think that Facebook would be a wonderful tool for a priest to use. Facebook is very prevalent with our youth today. And they are the future of our Church. And if having a priest as a friend on Facebook makes you uncomfortable, then I would ask what are you doing that you don’t want your priest to see or read about? I also think that as an evangelization tool it would be a great media to reach out to people and answer their questions. Or to provide information about your homily or a class being taught in the parish. Facebook is not the “TOOL” but it is one you can use effectively. Just look at what Father Frank Pavone has done with his. 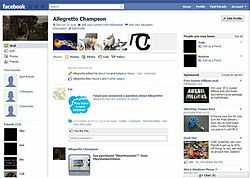 You can avoid all the problems you mention regarding “Friending” people by setting up a “Fan page” instead of a normal Facebook page. That way people can follow what you say by “Liking” your page instead of by Friend requests. That’s a way to have a presence on Facebook without any of that awkwardness that Friending people could cause! Mary–I’m glad you brought up the “wise priest”/confession et al statement. My brother was very wise in setting a precedent from the beginning of his ministry to not hear confessions from family members. While he acts as Christ’s representative on earth–he is also a human mortal who must live and interact on a human/earthly basis with family members (and friends). It would not be fair to put him such a position of burden to hear family confessions (um, hello, Christmas dinner conversations? family infighting?). Likewise, it might not be charitable for a good friend to seek a good priest friend as a confessor….it might be 1. an undue burden on the priest and 2. a missed opportunity on the confessor’s part to truly dig deeper and gain insight into themselves and their life. I have a friend in Priests for Life who has more than 4000 Facebook friends. Our young pastor has more than 350. No problems that I know of. I’m going to have to go with the rest of the commenters here. Facebook is a good place for priests. They are our spiritual fathers and their advice and counsel is as relavent in the cyberworld as it is in the real world. I think some of the reasons you cite for being hesitant are rather superfluous. I am a youth minister in our parish and it is diocesan rule that youth ministers do not seek out the friendship (online or otherwise) with their youth group kids. However, if they are online and request your friendship then it is okay (a nuance to be sure, but relevant to this situation). I think it is more than appropriate for a priest to “friend” his classmates, etc. without “friending” any of his parishioners. If they see him on there, they can request the friendship, but if the priest remains consistent in his dealings with people, then there is no reason for any of his parishioners to be upset. Lastly, facebook is a great place to share interesting, thought provoking links, videos, diocesan/parish news, etc. and raise the level of conversation. Many of the priests I know who are on facebook also run a blog and feed their posts/homilies directly from their blog onto their facebook pages. It is a great source of spiritual support to have those resources right at my fingertips without taking the time to search through on the internet to find each of their blogs. Final analysis, it is a very effective way of expanding your ministry as long as you remember that you are still a priest while using it. As a seminarian, now is a great time to decide for yourself just how useful it can be if you so choose. It is good to see old friends, such as Tarheel, here. Numbers are building up and good discussions are occurring. I am fully in favor of priests using Facebook. Some priest friends of mine subscribe and birthday greetings and friendly messages help spread the good news. Priests can only help those they are in contact with social interactions can be very beneficial. Its ironic to see ‘men of god’ use an atheist’s invention to spread the word. Let’s face it, many enlightened people of today view religion as only mythology. Medieval organizations, such as the church, face an uphill struggle against the forward march of civilization.